Feel bored to go to the gym? Give these custom made Cannon Ball Grips a try. There's a lot to be said about large muscle group and core strength training. The spherical shape of the ball makes these perfect to give you a forearm burning workout. There is lack of training aids on the market that allow you to train for a hand injury, but the ball does. With the open hand design, all of your hand tendons lay ergonomically around the ball allowing you to continue to stay on top of your core and upper body strength; injured or not. Since you can rotate the cannonballs while on them, you can switch from pull up, to chin, to biceps pull up all in one set. The diameter of each ball is about 3 inches which is smaller than the size of a regulation softball. Common places to hang the bombs are from pull up bars, rafters, doorways and of course, everywhere you would think of putting up a pull up bar. You can use them for pull-ups or attach them to a barbell, kettle bell, or dumbbell to enhance grip strength across nearly any part of your regimen. They look and feel indistructable. Occasionally also take them for a farmers carry of a single kettle bell while walking the dog. If ever there is a question whether the cannonball grip is worthy, just ask yourself after a couple sets of cannonball grip pullups, 'could I have done more regular grip pullups on the bar without the cannonballs?' If the answer is "yes" (it will be) you know you are really working your grip and forearms with the cannonballs. My weakness has been my grip strength. As my lifting has progressed to heavier weights my grip has been a limiting factor and I have resorted to using lifting straps. They have proven to be a double edged sword as my grip strength never seems to catch up! 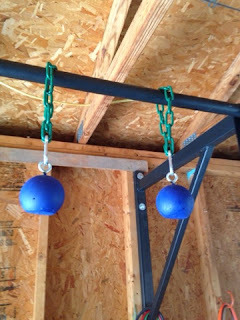 Spring grips or rubber squeeze balls just doing seem to help with the hang strength needed. Enter the Cannon Balls. Nothing I have used has been as effective or intense as these for working the forearms and grip strength. Even as I sit here I am having a hard time typing because my fingers aren’t moving right after a workout. After a month of use I have seen huge improvement in my grip strength. I would recommend having some lifting chalk as they do tend to get a little slick. The value is definitely there and I love that they are custom made. There are a few rough spots on the finish but that is expected with concrete, just be careful with dropping them also! Get your custom made cannon balls by visiting Great Scott Atlas Stones on Facebook! Great Scott Atlas Stones - They are made to order and can ship them to anywhere in the country. Rouge sells theirs for $70.00. But order from Scott for only $24.99 + shipping!